Mystery Craft Challenge Participants and Prizes! AHHH. GUYS! I feel like the long lost fourth Pointer sister, but I'm so excited and I just can't hide it. 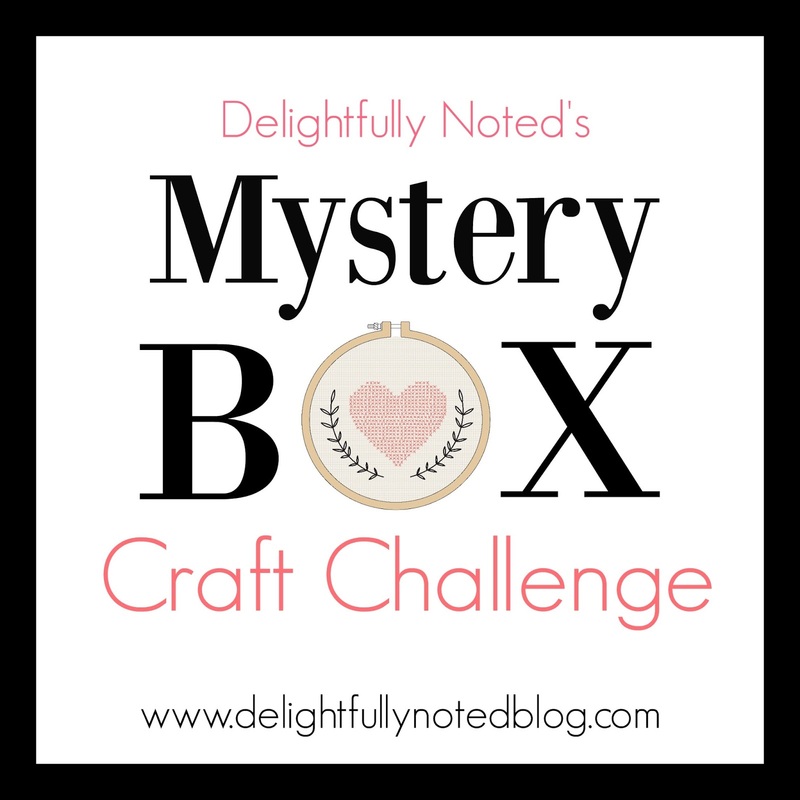 It's time to announce the starting line-up for the 2nd Annual Mystery Craft Challenge! Before I share the list of participants and the prizes they're competing for, let me briefly explain how things are going to go down here the last week of August. A few weeks ago I packaged up a mystery craft item and sent it out to the participants. Their task is to make something out of that said mystery item. They may still like me, they may not....only time will tell. All I know is I can't wait to share with you all what they have been up to. I just know you are going to love all of their different interpretations of this craft item. 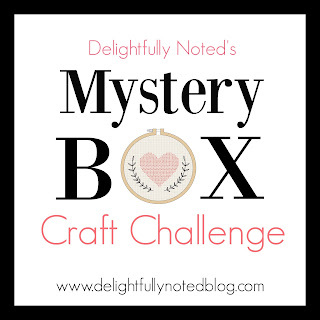 Honestly, August 28th, which is the Mystery Craft challenge reveal week, cannot come fast enough! 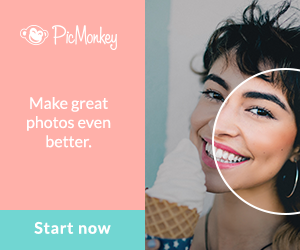 Once everyone gets a chance to share their fun, creative project, YOU get to vote for your favorite! Now onto the prizes! Behind every single one of these great prizes, is a great shop owner who is generously offering to donate to my challenge and I can not thank them enough! Of course, I would love if you guys would show them some love by visiting their stores or go hang out with them on Facebook or Instagram, but honestly don't do it for me, do it for yourself. I promise you won't be disappointed! These are women-owned businesses...because who runs the world? Girls! Sorry, something about women entrepreneurs brings out the Beyonce in me. 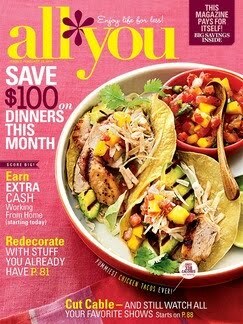 Oh, yes, did I mention the grand prize winner of the Mystery Craft Challenge is going to be one lucky lady?! Look at all of these goodies she'll be winning! 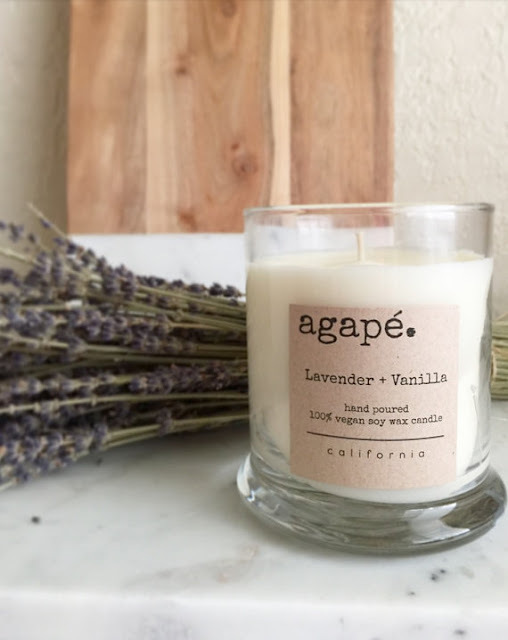 One hand poured soy candle from Rachel of Burlap Bow Decor I fell in love with Rachel and her home first (a must see over on Instagram) and then I was over the moon when I saw she started to sell her own line of candles, called Agape. She started her business one evening in her kitchen, after a day of unsuccessful candle shopping. What a go-getter, right? I mean I come home from a day of unsuccessful jean shopping and just sit on the couch and eat more white chocolate pretzels. The Craft Challenge Queen will receive one of Rachel's soon-to-be released fall scents. FUN! 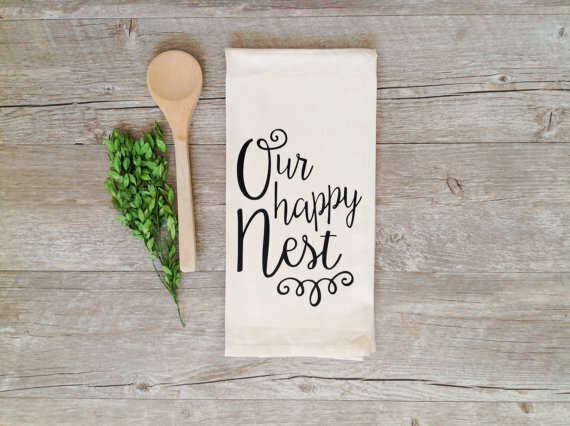 "Our Happy Nest" tea towel from Erin of Kitch Studios. I'll never forget the day I stumbled upon Erin and her delightful shop. I think I spent close to a half hour admiring all of her screen printed goodies. Even more I love the birth story of Kitch Studios! Erin and her hubby met in a band and grew tired of paying someone else to screen print their band gear, so they bought some used screen printing supplies and the rest is history. 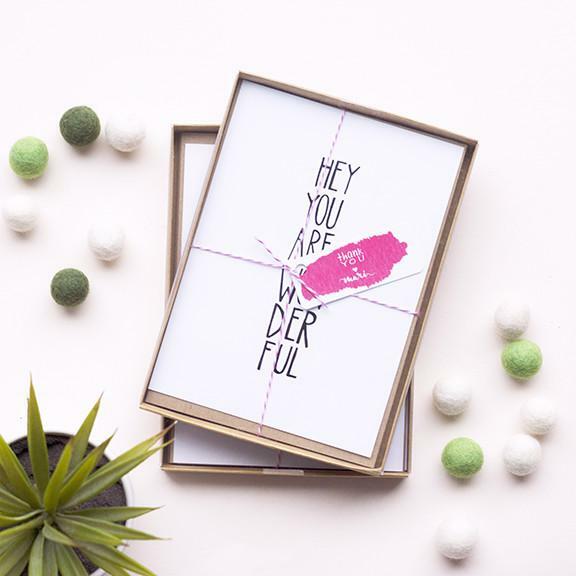 Erin wants her customers to be downright giddy when they receive her goodies and I have no doubt that is EXACTLY how our craft winner will feel! 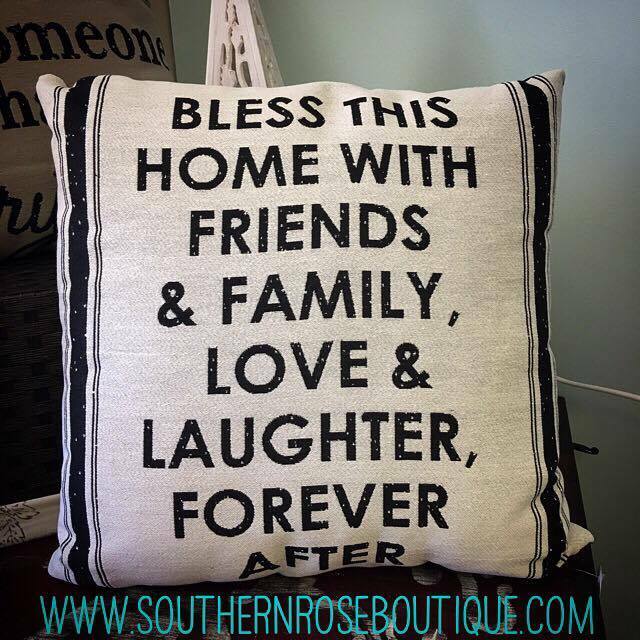 "Bless This Home" pillow from Regina of the Southern Rose Boutique. One can never have enough throw pillows! I love checking out all of the goodies this shop has to offer. 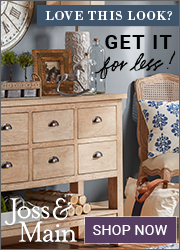 There is everything from home decor to t-shirts. The good news is you can shop online or if you live in the south, pay my dear friend, Regina a visit by stopping in at her brick and mortar store in Plains, Texas. 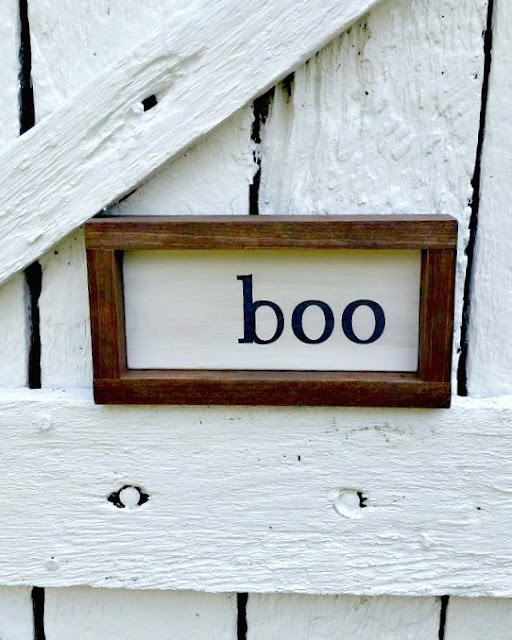 A rustic farmhouse "boo" sign from Melissa of My Trusted Treasures. I just adore this Halloween-inspired sign! I'm a tad addicted to wooden signs, so whoever the winner is, hold this prize closely, my dear. Wink, wink. Melissa is a wife and mother to 3 and is a lady after my heart with all of her beautifully, rustic signs. I love seeing how she uses them throughout her home decor over on Instagram. Gives you lots of ideas! Surprise stationery from Mari of Mari Orr. If you're ever looking for a little pick me up, do yourself a favor and head to Mari's Instagram. Holy smokes, right? Mari, a chemist turned artist, is incredibly talented and pours her colorful heart into every piece of art she paints, photo she takes, and image she designs. She is a woman of many, many talents and I know you'll love the what ever she sends your way! Please make sure to check out all of these shops. These ladies contribute a lot of time and labor to their dreams! And now let's give a round of applause to this year's starting line up! I was so incredibly thrilled by the number of people who signed up to play this year. Unfortunately, I couldn't take everyone but I'm really excited about this group of 13. Wish them luck! (Some of these gals are fellow bloggers, Instagrammers, or shop owners. You can also find me sharing all kinds of craft challenge shenanigans over on Instagram too. Hope to see you there! Project reveals and voting will go live the week of August 28th. Be here, or be square. The prizes are all fabulous!! Such talented ladies. Can't wait to see what everyone comes up with. Thanks for this fun challenge!